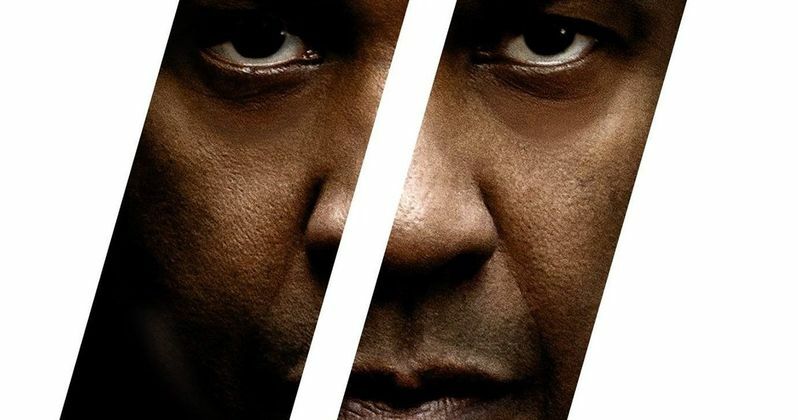 The first poster and images of Denzel Washington in The Equalizer 2 have arrived online. This marks our first real look at the upcoming sequel ahead of the debut of the movie's first teaser trailer, which will be released tomorrow. This is also the first time that Washington, one of the most accomplished and respected actors working today, has ever done a sequel to a movie in his long, illustrious career. So that in itself makes this something of an important-ish movie, even if it is just a sequel to a better-than-average action movie. The Equalizer 2 sees director Antoine Fuqua back at the helm as well. This also marks the first time that the filmmaker has made a sequel in his career. Little has been revealed about the movie up to this point, and the first poster takes something of a minimalist, but stylish approach. So that doesn't give us much to go on either. But the poster does confirm that the movie is coming our way on July 20, which is just around the corner. That makes this forthcoming first teaser trailer all the more interesting. Does this movie have some big secrets to hide that the studio is trying to keep under lock and key? Or did it just not turn out that well and they're sort of just dumping it with a relatively minimal marketing campaign? We'll have a much better idea of which situation it's closer to once we see some footage. The Equalizer, which was released in 2014, was financially successful, bringing in $192.3 million worldwide, working from a budget of $55 million. So, even though it took four years, that's why we're getting a sequel. The first movie centers on Denzel Washington's Robert McCall, a retired special agent who is trying to leave his former life behind who dedicates himself to creating a quiet new life. However, when he meets a teenager who has been manhandled by violent Russian mobsters, he simply cannot walk away and puts his set of formidable skills to use. Similar to John Wick, there's no reason this can't pull a John Wick: Chapter 2 and up the ante now that McCall is out of retirement. With the movie coming out on July 20, it's going to have some serious competition. The previous week sees the release of Hotel Transylvania 3 and Dwayne Johnson's Skyscraper. On the week of, Mama Mia: Here We Go Again drops, but The Equalizer 2 will certainly be going for a different audience. The following week sees Mission: Impossible - Fallout and Teen Titans Go! To the Movies though. This is why releasing in the summer can be tricky. Be sure to check out the first poster and photos from The Equalizer 2, courtesy of the Fandango Twitter account, for yourself below and check back with us for the first teaser trailer tomorrow.